Police Scotland is warning the public to be alert for counterfeit Bank of Ireland £50 notes. The fake cash is mainly being used in Dumfries and Galloway, The Borders, Stirling and Tayside. 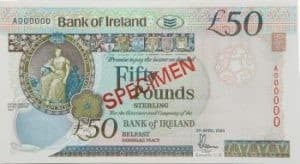 Detective Inspector Iain McPhail said: “Suspects are using both an old style £50 note which is green in colour and the newer note which is purple. Shops should only be accepting the newer purple note. “If anyone is presented with a green old style £50 note they should be declined and the customer informed to take them to their local bank. “All genuine new style purple Sterling notes feature a watermark, a hologram that changes, a series of dashes which become a solid line when held up to light and has the name of the Bank in raised print. Each note has an individual serial number. If anyone suspects they’re being presented with a fake note they should decline it and consider contacting Police Scotland via 101.